The Renewable Energy Policy Network for the 21st Century (REN21), a global renewable energy multi-stakeholder policy network, published its Renewables 2017 Global Status Report (GSR) in Beijing, China this week. This yearly publication provides comprehensive overview of the renewable energy (RE) sector and market covering power, heating and cooling and transportation sectors. RE contributed to an estimated 19.3 per cent of global energy consumption. 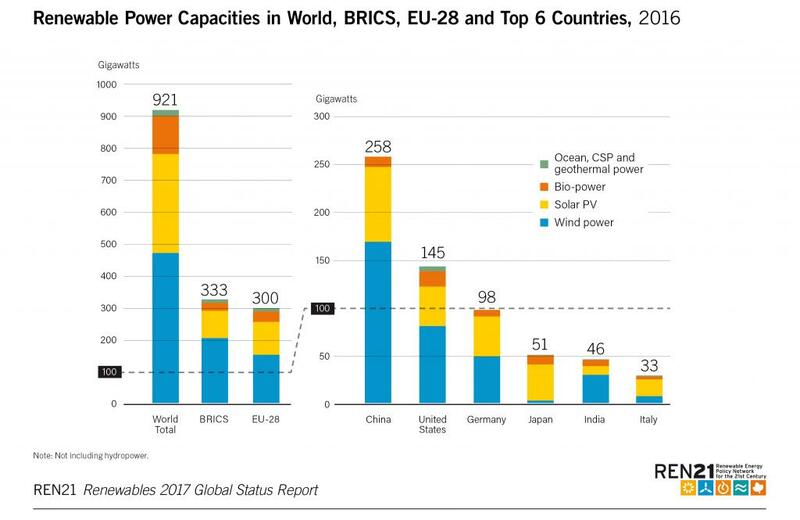 Most of the new RE capacity was installed in developing countries, mostly in China. In fact, China has been the largest developer of RE in power and heat sector over the past eight years. However, the share of bio-energy in total primary energy consumption has remained more or less the same as 2005, despite a 21 per cent rise in overall energy demand over the last 10 years. China is the leader in the world in terms of installed capacities of hydropower, wind power and solar PV. When compared with 2015, the installations of solar PV increased by 45 per cent, making a capacity addition of more than 34 GW. 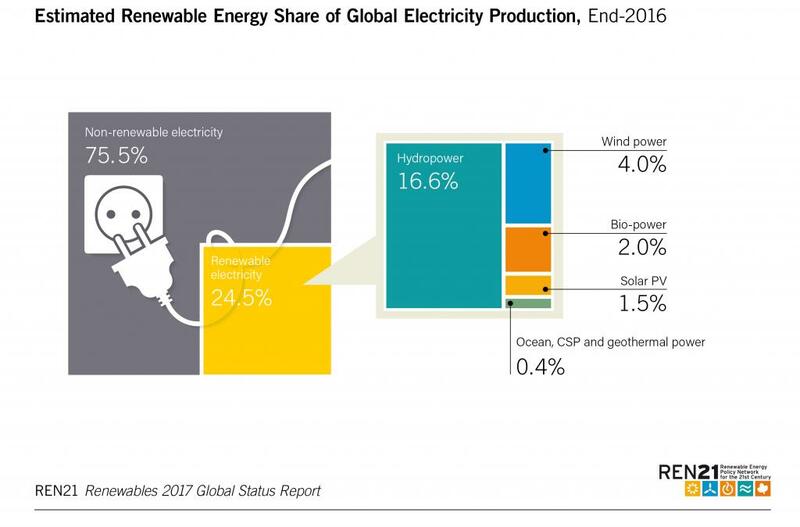 Outside China, most of the renewable power generated in Asia is from hydropower, but its share is relatively decreasing as compared to other renewable power technologies, especially solar PV. In 2016, total 75 GW of solar PV was added worldwide, taking the global solar PV capacity to 303 GW. This tremendous growth was brought forth because of record price reductions for modules, inverters and structures. There were unprecedented lower bids for wind in Chile, India, Mexico and Morocco. Off-shore wind also saw decline in costs in tenders in Denmark and Netherlands. The decline in costs has made cost of solar PV competitive with conventional sources of power in some countries. It is a good sign for the renewable sector, however; the sector is still vulnerable to policy changes as some countries like the United States are still trying to protect fossil fuel industry. On the other hand, these low bids have raised questions whether these projects will be financially viable or will these projects ever reach completion. Many cities, states, countries and other corporations have stated their commitment to meet 100 per cent renewable energy targets not just because of the climate and environmental requirements, but also because it makes more financial and business sense. At COP22 in Marrakesh, Morocco in November 2016, the leaders of 48 developing nations committed to work towards achieving 100 per cent renewable energy supply in their respective nations. The process of providing electricity access through grid extension alone is taking back seat in countries across the globe as new business models have facilitated the development of off-grid and mini-grid markets. 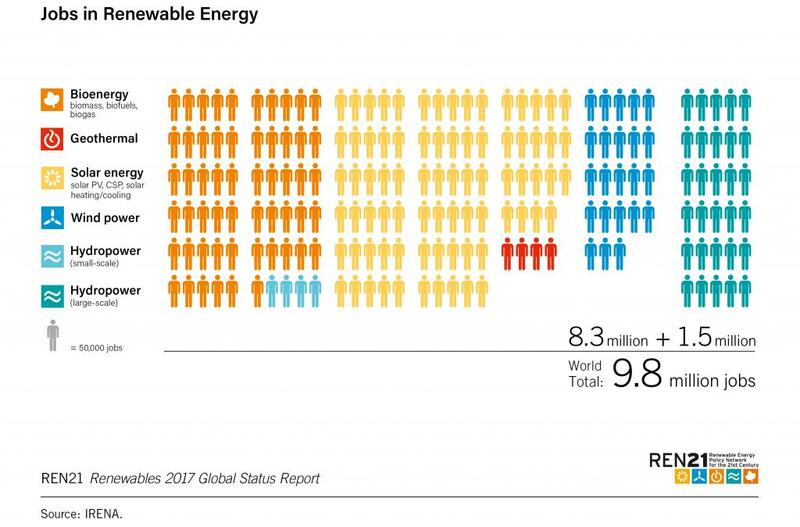 The renewable energy sector employed 9.8 million people in 2016, an increase of 1.1 per cent over 2015. In terms of technology, solar PV and bio-fuels provided the largest numbers of jobs. Employment shifted further towards Asia, which accounted for 62 per cent of all renewable energy jobs (not including large-scale hydropower), led by China. Renewable energy contributed only nine percent to the total global heat demand. In 2016, majority of renewable heat continued to be supplied by biomass, with smaller contributions from solar thermal and geothermal energy. Solar was used in process heating in beverage as well as mining industry. District heating systems started using solar thermal energy for larger installations since the heat also provided flexibility to electricity systems by storing thermal energy. Liquid bio-fuels provided around four per cent of world road transport fuels. Electrification of the transport sector increased in 2016 but not at the pace of the power sector. This is primarily because policy support for the transport sector lags behind. 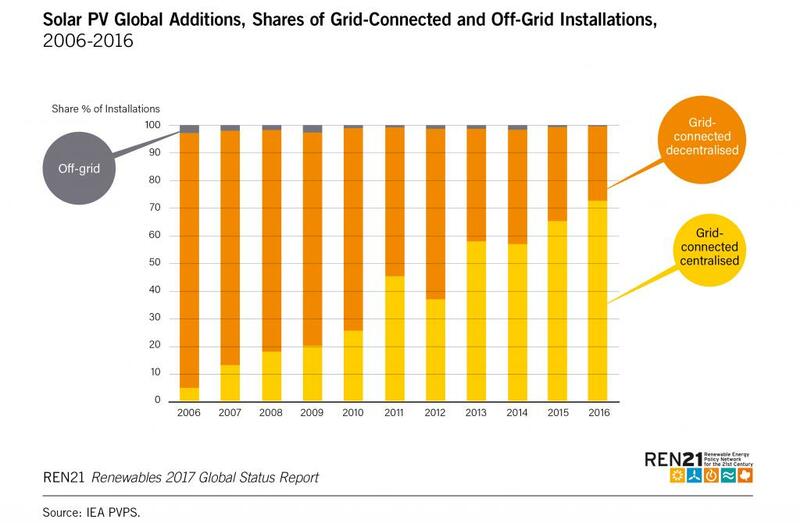 There are no direct links between renewable energy and electric vehicles (EVs), but with increasing share of renewables in grid power. Electrification of the transport sector can create a new market opportunities for renewable energy and integrate renewable energy. Despite many positive trends in the renewable energy sector, it is not transitioning at a pace that is needed to meet the targets committed in the Paris Accord in December 2015 in COP21. The Nationally Determined Contributions (NDCs) of the 117 countries combined would increase the global temperature between 2.3 to 3.5 degrees Celsius. 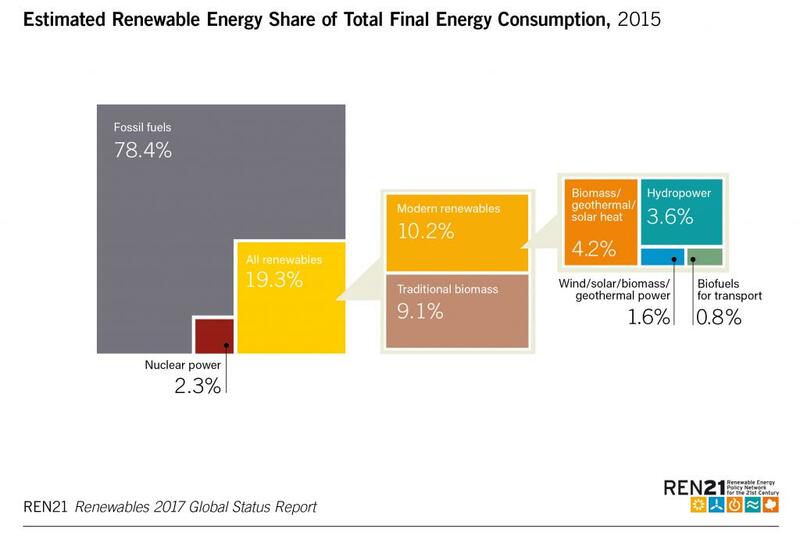 Even though the power sector is changing its ways and getting more and more renewable energy in the mix, the other energy-consuming sectors are not keeping up. 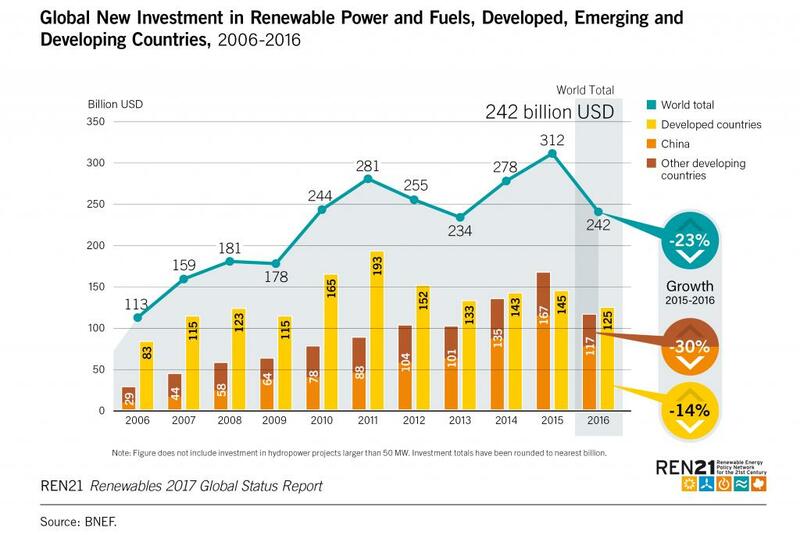 The investment in renewables fell 30 per cent in developing and emerging countries and 14 per cent in developed world. Does Africa's future lie in solar revolution? As of the end of March 2017 the total installed wind power capacity was 32.17 GW. AP is nowhere compared to Tamil Nadu. In fact to avail liberal incentives like Depreciation Wind Turbines were put left and Right in Ramagiri and Kadavakallu based on Wind Data from 4 Masts. The Power production at Ramagiri(Where largest number of Wind Turbines operate) is very low(About 12 lakh Units per MW) compared to about 29 Lakh Units at Muppandal,Near Kanyakumari in Tamil Nadu District. NREDCAP in collaboration with C-WET(Now National Institute of Wind Energy) should have initiated Wind Velocity studies in places like Dargam,Sangam,Jonnawada etc. in Nellore District AP. Since Winds are moderate in identified Windy areas in AP, it makes sense to initiate Studies to identify Offshore Wind farms across long coast of AP. Australia, with isolated examples elsewhere . In India Depreciation Benefits are given to only big Industries investing in Renewables. Why not Government give Income tax benefits to Individual tax payers who invest in a WIND FUND(to be created by the Government) and give tax exemption under Section 80 C to start windfarm co-operatives. This way there will be mass participation in Wind Energy. Offshore wind power refers to the construction of wind farms in bodies of water to generate electricity from wind. Better wind speeds are available offshore compared to on land, so offshore wind power’s contribution in terms of electricity supplied is higher. However, offshore wind farms are relatively expensive. potential offered by offshore wind turbines, especially in lands close to water . offshore wind farms on a massive scale. Coastline of Indian mainland is 6100 km. 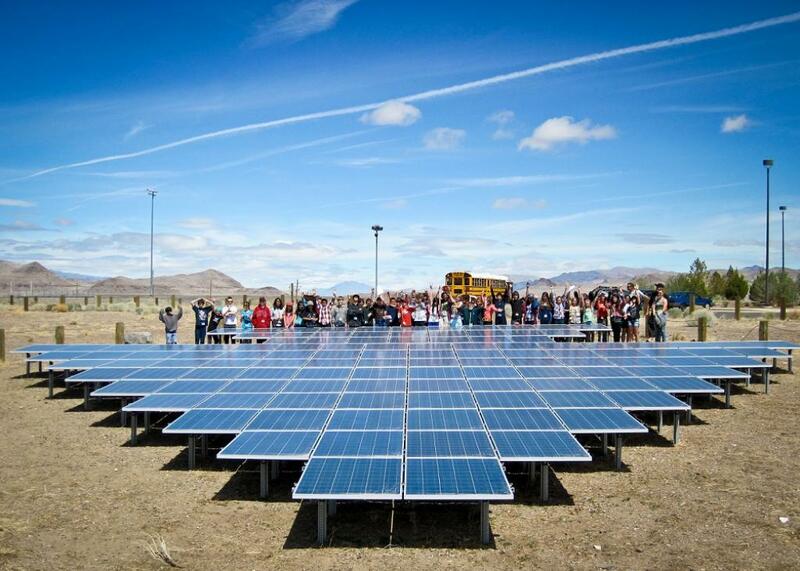 by MNRE which will help as a Demonstration project. quickly) and hence correlate the nearest wind mast data. That is why there will be variation in the output. Moreover terrain also plays an important role in wind energy production. Remote sensing measurement techniques enable measurements to hub height and beyond. There are resource measurement technique using sodar and lidar which need to be adopted in India along with at least 75 meter Wind masts.